So rather than trying to improve our diet and exercise (because who has time?) we often look for the next best medication or health supplement to take to help improve our health and quality of life. As a result, the market has become flooded with a number of dietary, herbal, and health supplements all promising to help promote health, help individuals lose weight, relieve joint pain, and provide them with the necessary vitamins, minerals, and ingredients for a healthy lifestyle. One of the most popular omega 3 fatty acid supplements to hit the market is Omega XL. But what is Omega XL and does Omega XL actually work? Read on for a complete comprehensive guide and review of Omega XL omega supplement. Patented Complex of 30 Fatty Acids Including DHA and EPA. Supported By Over 30 Years of Clinical Research. Promotes Natural Joint Pain Relief - Omega XL. Relieves Joint Pain Due To Inflammation. Omega XL is becoming a popular brand of omega 3 fatty acids supplements to hit the market. Omega XL is said to help treat and relieve pain and inflammation while also improve overall health and reduce the risk of diseases and illnesses. Many dietary supplement and health aid brands offer supplements that include omega 3 fatty acid supplements. The most common source of omega 3 fatty acids is fish oil. Omega 3 fatty acids or fish oil supplements have proven to provide numerous heart health benefits, including improving cardiovascular health, reducing the risk for heart disease and stroke, and also reducing blood pressure and high cholesterol. Omega fatty acid supplements typically include fish oils, krill oils, and DHA and EPA supplements, which are known for their natural anti-inflammatory agents. Omega 3 fatty acids contain EPA (eicosapentaenoic acid) and DHA (docosahexaenoic acid) levels, which can be commonly found in various types of fish and shellfish. Omega 3 fatty acids are also referred to as essential fatty acids. They are considered “essential” is because the human body cannot naturally produce them on its own. Omega-3s are known as “healthy fat” sources. Therefore, many will consume different types of fish, nuts and seeds, and shellfish, and even take dietary health supplements to get sufficient Omega-3s and essential fatty acids. In fact, numerous scientific and clinical studies have shown that omega-3 fatty acids provide a number of health benefits, including reducing the risk for heart disease and metabolic disease reducing pain and inflammation at the cellular level, promoting joint health, improve neurological function, regulate moods, boost hormone production and even help reduce asthma symptoms. Unfortunately, studies have shown that most people suffer from omega-3 deficiencies because they don’t include a sufficient amount of essential fatty acids or essential foods in their regular diets. Omega XL is a relatively newer brand of nutritional health supplements that is made with DHA, EPA, and a number of other essential fatty acids. The proprietary formula in Omega XL is formulated to serve as a joint health supplement, helping to relieve inflammation and joint pain. Omega XL are oral soft-gel pills that are easy to swallow and do not have a fishy odor or taste.Omega XL is a highly concentrated Omega-3 “Super Oil” supplement that is extracted from the Green Lip Mussel (Perna Canaliculus) from the natural New Zealand waters. This unique and patented omega supplement contains over 30 different healthy and essential fatty acids, and contains up to 22 times more omega 3 fatty acids than regular fish oil supplements. Omega XL is also allergen-free for individuals who are sensitive to fish or oil-based products. The Patented lipid extract found in this omega product has been studied for over 30 years by various medical professionals and scientists. These clinical studies have also been published and have demonstrated to significantly reduce joint pain associated with inflammation and inflammatory conditions. Some studies also suggest that even individuals who are allergic to shellfish can consume this omega product because all proteins have been removed, however, the results are this hypothesis are inconclusive at this time. What Makes Omega XL Better Than Standard Fish Oil? There are a number of omega 3 fatty acid health and joint supplements available on the market, including regular fish oil, which is recommended by many medical professionals and health care physicians, but what makes Omega XL better than regular fish oil supplements? Many fish oil capsules have an unpleasant “fishy” odor and taste, and the capsules are incredibly large, making it difficult for individuals to swallow them. Some individuals also claim that fish oil makes them feel “gassy”. Although fish oil supplements contain natural ingredients that promote numerous health benefits, Omega XL is an omega 3 oil supplement that is similar to both krill and fish oils that is designed specifically to help treat pain and inflammatory diseases, specifically joint pain associated with arthritis. Another reason why Omega XL is better than standard fish oil supplements is because Omega XL clearly states the sources of its products. Coming from New Zealand, this does provide a guarantee that this omega product has had limited exposure to chemicals and free radicals found in abundance other parts of the ocean. In addition, using mussels found in clean water also significantly lowers the level of mercury of omega 3 fatty acids, making it a safer and more effective product all around. Standard fish oil supplements and products are often made with large fish. Depending on the waters in which they are caught, these fish sources may have demonstrated higher mercury levels. Although some mercury is healthy, consuming too much mercury or omega products with high mercury levels can actually do the body more harm than good. What is in Omega XL? Omega XL IngredientsAs mentioned above, Omega XL contains all natural ingredients, all of which have proven to promote joint health, heart health, and can help combat other conditions as well as obesity. These natural ingredients include the following:Perna Canaliculus PCS0-524 Patented Oil Extract: This ingredient is a lipid that is extracted from the New Zealand Green Lipped Mussel. This particular mussel is higher in omega 3 fatty acids than standard fish oil and has anti-inflammatory effects, making it an essential ingredient in this omega anti-inflammatory drug. Monounsaturated Olive Oil: This ingredient contains a compound similar to what is found is aspirin and ibuprofen. Its natural chemical properties help relieve pain and treat inflammation associated with joint pain and arthritis. Although olive oil has no known negative side effects, and is often used in daily food preparation in some households, some individuals may have allergic reactions to fish or oil-based products. Vitamin E: We all know Vitamin E has a number of health benefits. It is not only a natural moisturizer for the skin, but it is also important to help the body produce healthy red blood cells. Both vitamin E and olive oil combined are effective anti-inflammatory agents that are beneficial for both short term and long term joint health.Although Omega XL claims that their omega product has 22 times the Omega 3 fatty acids when compared with standard fish oil capsules, however, there is little research to support this claim. Additionally, Great HealthWorks (the company behind Omega XL) provides information on extracting ingredients form the Green Lip Mussel, as well as where the ingredients come from, there is little information regarding the ingredient breakdown. For example, Omega XL claims that DHA and EPA are present in their omega products, however, there is no further information about the amount or percentage of DHA and EPA actually in the omega product. As a result, without really knowing the amounts of DHA omega and EPA omega individuals are consuming, then it can be difficult to determine the overall effectiveness of the product. Omega XL claims that their omega product and anti-inflammatory drug and joint supplement is backed by over 30 years of clinical research. And after some thorough investigation, we found this to be true. Numerous clinical studies have been performed to determine the overall effectiveness of Omega XL in treating pain and inflammation associated with arthritis and a number of other conditions. Clinical studies have determined that Omega XL has been effective in treating pain and inflammation in individuals suffering from osteoarthritis in both the hips and the knees. Individuals who took Omega XL for up to 12 weeks reported significant improvements in joint pain and even saw an improvement in mobility. Therefore, this suggests that Omega XL can indeed reduce inflammation and increase connective tissue production within the joint. In addition to effectively reducing pain and swelling, studies have also concluded that the ingredients found in Omega XL can help to significantly reduce inflammation in cells. This finding can go a long way in reducing the risk for cardiovascular disease, metabolic disease, diabetes and even reduce the likelihood of becoming overweight or suffering from obesity as a whole. What was surprising from the Omega XL clinical studies is that findings actually showed that Omega XL ingredients have also improved asthma symptoms, particularly in exercise induced asthma as well as in mild to severe asthmatic individuals. Asthmatic individuals also saw a decreased need to use an inhaler or other type of asthma medication after taking Omega XL for approximately eight weeks. As a result, we can conclude that taking Omega XL supplements can help to reduce asthma symptoms after exercise and even during peak allergy seasons as well as performing daily tasks, ultimately reducing the overall severity of asthma symptoms in some individuals. What Are the Omega XL Side Effects? The benefits of Omega XL are clearly proven, but what about the side effects? Although Omega XL is made from natural ingredients, and supposedly contains dosages of DHA and EPA and fatty acids, are there any side effects? After reviewing numerous sources and customer testimonials and feedback, Omega XL can cause some gastric issues, such as an upset stomach, nausea, gas and bloating. These particular side effects cause more discomfort rather than serious dangerous or hazardous side effects. In fact, these symptoms were only temporary in most cases, and subsided after only a few days. Additionally, these side effects are most apparent when consuming Omega XL in large doses.Most medical professionals and health care physicians will advise individuals to begin consuming Omega XL in smaller doses to allow the body sufficient time to adjust to the proprietary formula (especially if you aren’t used to taking supplements or consuming large amounts of omega 3 fatty acids). Smaller doses will help to avoid an upset stomach as well as gas and bloating.However, if symptoms continue to persist or if you have a known allergy to shellfish or any other ingredient present in Omega XL, then be sure to consult a health care provider or seek medical attention to see if it is safe for you to consume Omega XL. As mentioned briefly above, Omega XL is a brand that is owned, produced, and manufactured by Great HealthWorks, a nutritional supplement company that also manufactures probiotics, heart health pills, and many other dietary aids. Great HealthWorks is based in the United States in Fort Lauderdale, Florida. Their contact information is clearly listed on the Omega XL official website. 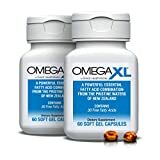 Omega XL is can be purchased online through the official Omega XL website and a number of other online retailers, including Amazon. Omega XL is only available in one bottle size, which contains 60 capsules. Most retailers will offer Omega XL in two-packs. The official Omega XL website states that they have a 90-day, money-back guarantee (on UNUSED products, only), however, some customer comments and reviews indicate that there was some difficulty in trying to receive a refund for unused products. Some individuals claim that Omega XL continued to charge their credit cards even after attempting to cancel the subscription. Individuals also claim that Omega XL is “too expensive”. Additionally, Omega XL also charges cancellation fees. Again, the 90-day money-back guarantee is only for unopened products. Therefore, if individuals purchase the “Continuity Pack”, for example, and after opening one bottle they decide that Omega XL isn’t for them, they will only receive a refund on the second, unopened bottle. This policy certainly isn’t unreasonable, however, this should be clearly communicated with customers. In summary, Omega XL is a safe dietary supplement that has proven to help many consumers relieve pain and inflammation associated with arthritis as well as other conditions. On the other hand, some users claim Omega XL didn’t work at all for the money they spent. All in all, 45 percent of customers (with confirmed purchases) claim that Omega XL is a great product that helped relieve pain. Additionally, the benefits of Omega XL as a product have been backed by scientific research and proven in various clinical studies. Although customer reviews have varied, it’s important to remember that individual results can and will vary. Some individuals may see pain relief after only a few days whereas others may not see results for several weeks. These results have nothing to do with the quality of the omega product, but has everything to do with the individual person. Each person reacts to health supplements differently, so it’s important to keep this in mind when trying a new supplement.We believe that the best way to see if Omega XL works for you is to give it a try. However, it may be best to see how a generic fish oil supplement works for you first before shelling out $65+ dollars for a bottle or two of Omega XL, especially since results are scattered across the board and are not guaranteed. The benefits of Omega XL are clear, and the product’s ingredients have been backed—and confirmed—by over 30 years of scientific research, and side effects are relatively minor and temporary, and are not dangerous in any way. Furthermore, Omega XL omega 3 fatty acid pills have demonstrated to improve pain, inflammation, reduce asthma symptoms and even reduce the overall risks of developing cardiovascular and metabolic disorders. Omega XL has also demonstrated an improvement in asthmatic symptoms in individuals suffering with asthma. Omega XL has proven to help reduce pain and improve joint mobility and promote joint health in individuals who suffer from osteoarthritis and rheumatoid arthritis. Additionally, by providing the information on where its omega 3’s are sourced, Omega XL guarantees low levels of toxins and free of allergens within its product. This makes Omega XL a positive form of omega 3 fatty acid supplementation, and a good choice in comparison to most standard fish oil or krill oil supplements. On the other hand, some of the company’s practices and customer services policies may be questionable. Additionally, some of the amounts of ingredients, such as DHA and EPA are unknown, which may be concerning for some individuals, especially since there are growing concerns about taking dietary supplements. After all, how do you know what you are putting in your body? Furthermore, the company’s potential for keeping ingredients a secret might raise a few eyebrows. All in all, there are a number of fish oil supplements that are high in fatty acids and that actually contain DHA and EPA, and that are more cost effective than Omega XL. However, the sources of cheaper fatty acid supplements might not be as clear, which can also be disconcerting for many individuals. However, the benefits of omega 3 fatty acids and DHA and EPA are clear, and are backed by scientific research. These supplements have shown to significantly reduce inflammation and pain, lower risks for some serious diseases, and even reduce joint pain, helping individuals to ween off pain medications and get back to enjoying their favorite activities, feeling better, and enjoying an active, pain-free lifestyle.